The HIIAB is part of the federal health care reform agenda. Several states have established these advisory boards, including California, Florida, Maryland, Ohio, Oklahoma, Oregon and Washington. The Oklahoma HIIAB advises the Oklahoma Health Information Exchange Trust, created in 2010 by SB 1373, also below. 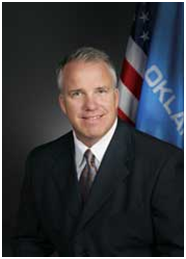 Initially, John Calabro, CIO for the Oklahoma Health Care Authority, served as the chair of the OK HIIAB. In August 2011, Jerry Scherer was appointed Chairman of the HIIAB by OHCA CEO Mike Fogarty. 2009  SB 757  By Burrage/Steele  Creating the Health Information Infrastructure Advisory Board (HIIAB). This bill was so significant in laying the foundation for Obama Care that we've listed most of the bill's language below. The fact that so many states established this same Health Information Infrastructure Advisory Board (HIIAB), indicates that this advisory board was created from model language. 5. Hub means a registry, a data repository, or a patient identity manager. c. the governance structure and policies and procedures for the health information exchange, ensuring that the strategy and plan preserve the privacy and security of health information as required by state and federal law. 3. Duties of the advisory board shall not include the development of a health data exchange; however, key features of a health information exchange shall be designed to integrate with a state health data exchange. c. procedures for coordinating, monitoring, and improving data exchange that is compatible with current adopters of electronic medical record systems and health information technologies. i. the CityCounty Health Departments. 6. Vacancies occurring in the advisory board shall be filled by appointment of the director of the represented agency. 7. The member from the Oklahoma Health Care Authority shall chair the advisory board, and the Authority shall staff the advisory board. 8. Each agency shall receive one vote and a majority of the members in attendance at a meeting shall be able to take action on behalf of the advisory board. This trust is governed by seven appointed trustees, without legislative oversight. The Trust and its beneficiary (the state of Oklahoma) have immunity against claims. Establish and maintain a framework for the exchange of health information, through a single or multiple health information exchanges, and encourage the widespread adoption and use of electronic health records systems among Oklahoma health care providers, payors and patients. Promote and facilitate the sharing of health information among health care provider within Oklahoma and in other states by providing for the transfer of health information, medical records, and other health data for�reduction of administrative costs and any other benefits deemed appropriate by the Trust. .consistent with applicable federal and State standards and laws. Solicit and accept grants, loans, contributions or appropriations from any public or private source and expend those moneys, through contracts, grants, loans, or agreements, on activities it considers suitable to the performance of its duties. To make and change investments, to convert real into personal property, and vice versa, to lease , improve, exchange or sell, at public or private sale, upon such terms as they deem proper, and to resell, at any time and as often as they deem advisable, ANY OR ALL THE PROPERTY IN THE TRUST, REAL AND PERSONAL. to purchase and sell such supplies, goods, commodities and services as are incident to the operation of its properties. 2011  HB 2130  By Steele/Jolley  Making the Secretary of Health and Human Services (Terry Cline) the Executive Director of the Health Care for the Uninsured (HUB) Board, to designate the members of the HUB, for the purpose of establishing the state health insurance exchange. This HUB would work with the already in place OHIET trust to establish the connections between health information exchange and the health insurance exchange, linking the patient, the provider and the payer. Freshman legislator Rep. Glen Mulready presented HB 2130 for Speaker/Author Kris Steele. An insurance agent, Mulready was elected in 2010 to HD 68 in Tulsa; Blue Cross/Blue Shield contributed $5,000 to his campaign. Due to the controversy, the OK Senate did not hear the bill in 2011. 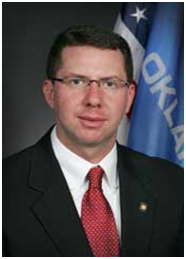 However, this contentious and controversial bill is still alive and will have to be stopped in 2012.
g. one member who shall represent the Oklahoma State Employees Benefits Council. 2. Appointees shall represent interests affected by insurance exchange requirements, including business interests, consumers and insurance providers. 5. Establish a system whereby if an individual qualifies for a subsidy under the premium assistance program, established in Section 1010.1 of Title 56 of the Oklahoma Statutes, that person is able to become enrolled through the HUB in conjunction with local, qualified insurance producers. for the certification of low&$045;cost health insurance programs designed to provide coverage to eligible individuals. Such programs shall not be required to include certain mandates. The Board may recommend that plans certified by the Commissioner be offered statewide to eligible individuals. E. The HUB shall receive no general revenue appropriations, but shall be funded by grants awarded to the state. Again, this contentious and controversial bill is still alive and will have to be stopped in 2012. Please call your Oklahoma elected officials and tell them to vote REPEAL SB 757 from 2009, REPEAL SB 1373 from 2010, and to vote NO on any version of HB 2130 in 2012. Web Site Design and Maintenance by OK-SAFE, Inc.